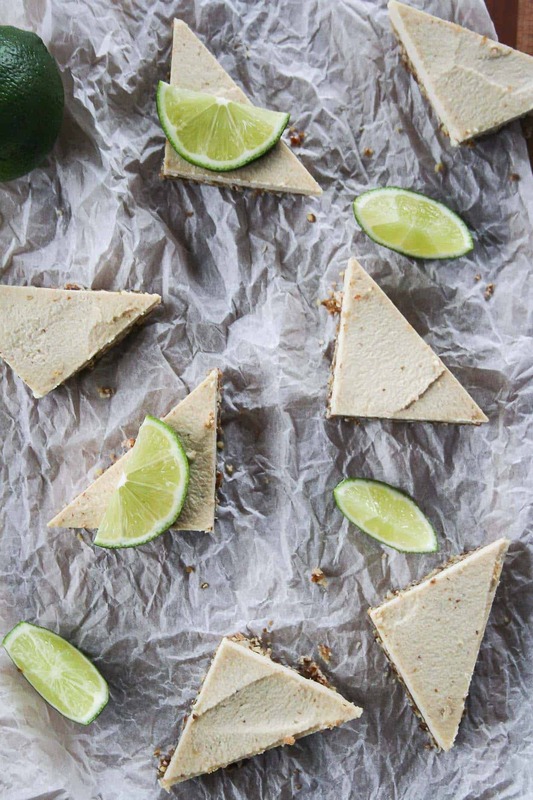 When you can’t choose between drinks and dessert, reach for Raw Margarita Cheesecake Bars! They are gluten free, dairy free, and (almost) guilt free! Happy Cinco de Mayo!! This could quite possibly be my favorite holiday of ALL TIME. Yes, you heard me right. All time. I mean, what is better than margaritas, tacos, and guacamole? Nothing. And that’s why Cinco de Mayo is ma fave. Last year for Cinco de Mayo, I had tacos every single day that week. As much as I love my margaritas (on the rocks with salt please), I always want something sweet after dinner. And I tryyyyy to not indulge in both, but it’s hard sometimes. That’s why today’s recipe is perfect. 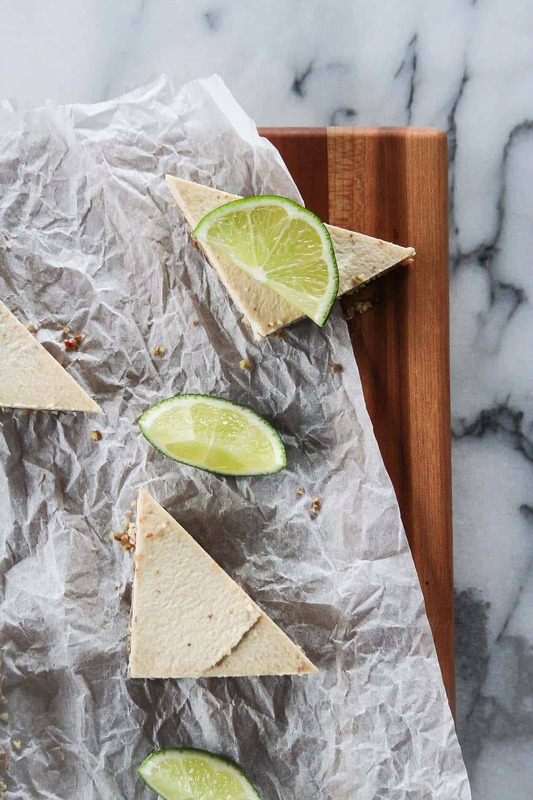 When you don’t want to choose between drinks and dessert, reach for these Raw Margarita Cheesecake Bars. So you probably figured this out, but to be clear… YES, these bars do contain tequila and a little cointreau too – just like I like my margs. The entire recipe makes 16 bars and only calls for 1 shot of tequila and half a shot of cointreau. But let me tell you, you can taste it furreal and I’m v v into it. It’s crazy how many food allergies there are these days and how quickly my diet has changed since being diagnosed with Celiac disease. I know the struggle that people with food allergies encounter everyday and I am here to help you create simple and flavorful allergy friendly recipes! Let me know (in the comments or send me an email!) if there are any recipes that you would like me to make allergy friendly! For more margarita-themed recipes, be sure to check out Hola Jalapeño’s blog! 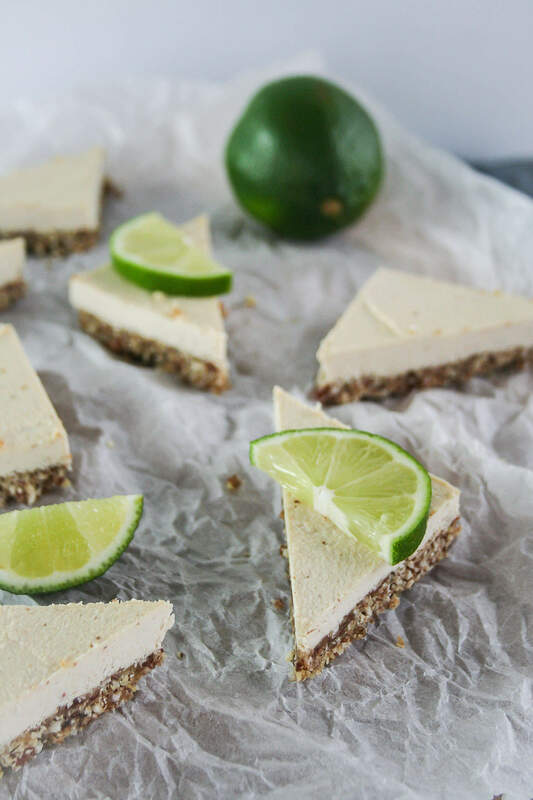 Make these Raw Margarita Cheesecake Bars, post a picture on social media and use the hashtag #imhungrybynature for a chance to be featured! Soak the cashews in water for at least 4 hours, preferably overnight. Prepare your container. I used an 8 in x 8 in pan lined with parchment paper. This will help remove the bars at the end. Add all of the base ingredients to a food processor and process until the mixture is finely ground and even in texture. It will not come together to form a dough, but if you press it between your fingers, it will hold together. Add the crust mixture to the pan, pressing down firmly to form an even layer. Place in the fridge to set while you are making the filling. Make the filling. Drain the cashews and process in the food processor with the rest of the filling ingredients. Process until smooth and creamy. Top the crust evenly with the filling, smoothing the surface. Lift the parchment to remove the bars from the pan, cut into 16 even triangles, and store in airtight container in the freezer. Remove from freezer right before serving. YUMMY!!! I want to reach through the screen and grab a couple of these!!! I am hoping to eat lots of chips, guacamole, and a few margaritas, because it is FRI-YAY! yesss! these look so pretty and look so tasty! 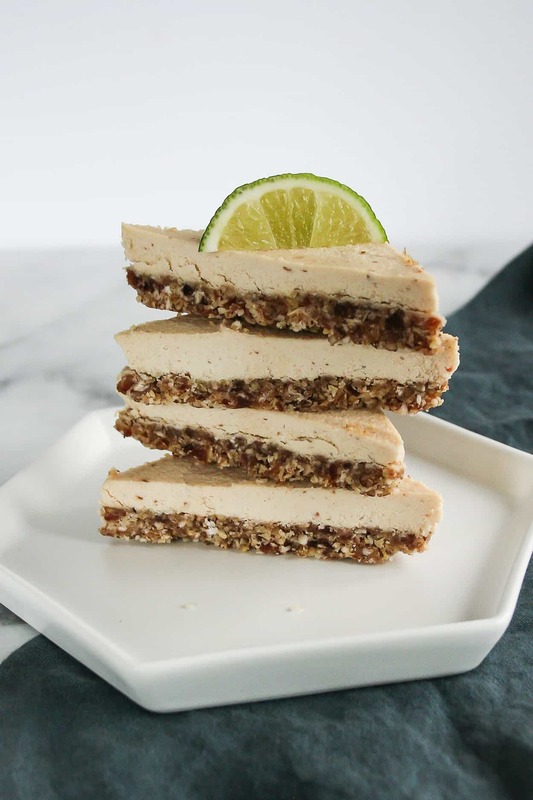 I love making raw cheesecakes, and love you still added a lil’ tequila in there! Thanks Kate! I was so excited to participate this year – please make sure I am on the list for next year! Wow you really had to get creative with these, and that’s so cool that you made them free of the top allergens. 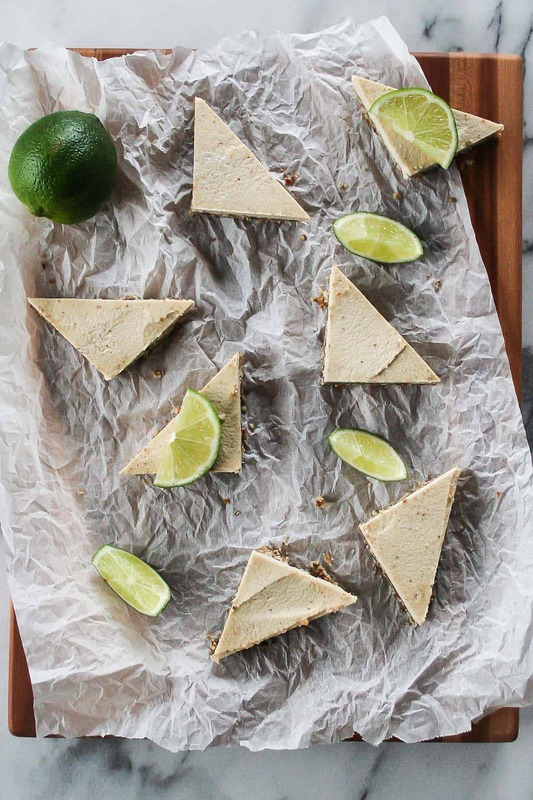 I love cheesecake, but I’ve never tried raw cheesecake. I based the recipe on my raw raspberry lemon bars and they have just enough tequila to really make it taste like a margarita! And thanks – making recipes for people with allergies is always a top priority! Thank you Robbie! I would just replace the tequila amount that you omit with the same amount of lime juice. Let me know how it turns out! !